Mickey Mouse was created in 1928 by the Walt Disney Company. Voiced by Walt Disney himself, he quickly became Disney’s symbol and one of the most beloved cartoon characters in the world. He is also the only cartoon character in the world to have a star on the Hollywood Walk of Fame. Mickey did not become boring or old-fashioned even though he is almost 100 years old. Being extraordinary popular among children, he was often refreshed or reinvented and today, Mickey Mouse is as popular as he was 50 years ago. The main character of Disney Channel’s Disney Junior Series ‘Mickey Mouse Clubhouse’, he is loved by countless small children, who learn to say ‘Mickey’ as soon as they can walk properly. Fred Flintstone is the husband of Wilma and the father of cute little Pebbles. Created by Hanna and Barbera, this character is a parody of the typical husband. Fred Flintstone and his best friend, the equally funny Barney Rubble, represent one of the greatest cartoon pairs of all times. We all grew up with them, laughing at their silly adventures that did not go beyond the usual escapades of a married man. However, the Flintstone Family was and still is, a cartoon of great success both among children and among their parents. This funny guy is a cyborg policeman who seems to be equipped with an endless amount of gadgets that should help him fight crime. Despite so many clever devices, he is clumsy and incompetent, in the manner of the famous inspector Clouseau from the Pink Panther. Joining the team of crime fighters are his genius niece and his brainy dog. In 1999, the animation was transposed into a Disney film starring Matthew Broderick. The movie did not have the same success as the animation. In 2011, a comic book based on the original 1983 series is to be released in the U.S.
Intended for adult audiences, South Park became a great hit in a very short period of time and has been running for over a decade. One of the main characters of this animated series, Cartman is usually portrayed in opposition to his friends. He can be attributed many characteristics, none of which may be considered positive. Thus, he is immature, spoiled, lazy, as well as racist, sexist, sociopathic and narcissist, so as to name but a few of his ‘qualities’. Bugs Bunny is 71 years old. This classical Looney Tunes character is one of the most famous in the world. He is full of personality and likes to play tricks to his equally renowned opponents. Funny to watch and entertaining, Bugs Bunny will probably be around another 70 year from now and the next generations will enjoy watching him as we did and still do. His favourite expression, ‘what’s up doc’ is as timeless as he is. A Hanna-Barbera production, Scooby Doo is an American media franchise based on several animated TV series which started with ‘Scooby Doo, where are you’ and continued with many other series such as ‘A pup named Scooby Doo’,’ What’s New Scooby-Doo’, ‘Shaggy & Scooby Doo Get a Clue!’ and the most recent, which is still running, ‘Scooby Doo! Mystery Incorporated. The funny dog is the pet and the best friend of Shaggy, with whom he shares some personality traits, mostly those of being cowardly and always hungry. They are ones of the most popular cartoon characters in the history of animation. Their adventures were comprised into 114 shorts, created in the period 1940-1958. No dialogues needed between these two opponents, and this lack is not even noticeable. The perseverant cat and the clever mouse enjoy playing tricks to each other and never get sick of running around the house in an endless mouse catching that usually results in Tom’s giving up (for the moment, that is). Winnie the Pooh was first created by A.A Milne. He gathered his stories about this little bear in a book called ‘Winnie the Pooh’ (1926). Following the book’s great success, he written several other volumes about Winnie and his group of friends. In 1961, Walt Disney Productions purchased the rights over the character and the series of animations featuring Pooh started. This character is loved by most of the children out there. The sweet teddy bear as well as the other characters of the animation are among the most recognized figures of today. With the upcoming release of the new ‘Winnie the Pooh’ movie, it is clear that he has still much to show to his young audience! 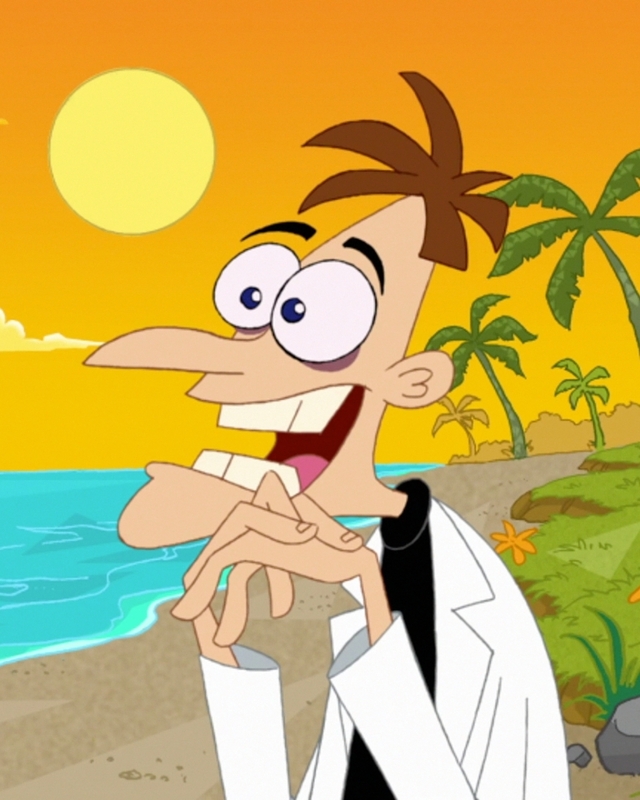 Dr. Doofenshmirtz is the evil character of the series ‘Phineas and Pherb’. He is an incompetent mad scientist whose only goal in life is that of taking over ‘the entire tri-state’. With this purpose in mind, he invents a new weird device with each episode. Doofenshmirtz explains his evil schemes by means of some back stories from his mentally abused childhood. One of the funniest current cartoon characters, he seems to gain in popularity every day and we may expect to see him around many years from now. I was pretty surprised to see that Eric Cartman made it to the top, though I really think South Park is funny. I liked the article. Great article you have here, I really enjoyed reading it. Cartman is definitely my favorite cartoon character, in spite of his ‘qualities’. Tom and Jerry rules! no matter how many characters will appear, Tom and Jerry will still be the best! So funny! I really enjoyed reading this article! Great job at it! Though I don’t think Dr. Doofenshmirtz is one of the best, still, good article!